As discussed in the article on the growing importance of marketing metrics, more and more marketers are expected to justify their marketing programs on a financial ROI basis. 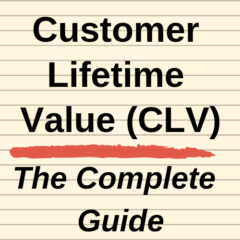 Fortunately as the customer lifetime value (CLV) calculation provides a present value financial evaluation of a customer, it is an ideal metric for evaluating marketing performance. Customer lifetime value has significant scope to provide value in the area of marketing return on investment (ROI). Efforts to reduce product, servicing and support costs. Let’s assume that the average customer acquisition cost for a company is $100. They determine that the profit contribution (after discounting on the present value basis) is $180 before consideration of the initial acquisition cost (which means that CLV =$80). In this case, the marketing ROI is ($80 / $100 = 80%. In other words, the marketing department has turned $100 into $180 by acquiring new customers. In this case, let’s assume that the calculated customer lifetime value for a firm was $500. The marketing area undertakes a major cross-selling campaign in an attempt to win greater share-of-customer. On a per customer basis, this is equivalent to $80 per customer. At the end of the campaign, customer lifetime value is then reassessed an increased from $500 to $540 (after allowing for the additional costs of up-selling). In this case, the marketing department has turned $80 into an additional $120 for the firm, resulting in an overall profit increase of $40 ($540 – $500 = change in CLV). This is equivalent to a 50% marketing ROI calculated from the $40 profit increase divided by the $80 campaign cost – (each considered on a per customer basis).